A Short History of a Small Town Funeral Home. The history of the J.W. Embser Sons Funeral Home began with the birth of John William Embser on February 8, 1873, to John Peter and Mary Zimmer Embser, both immigrants from Germany. The fourth of seven children, he was raised in Dansville and apprenticed to a barber during his teens. Around 1900, he decided to follow the funeral profession, and became an apprentice embalmer at a firm in Hornell. During this time, he met and married Agnes OBoyle, dressmaker for the funeral firm. After completing studies at the embalming school in Syracuse, he moved to Wellsville and worked for the Rauber Furniture and Funeral Director Business for about 7 years. In 1913, John W. Embser purchased the struggling firm of James Earl. With the funeral parlors across from Fassett House and the two horse drawn carriages acquired from this transaction, he founded the Embser Funeral Home. The beginning years were difficult, but the Embser Funeral Home eventually gained a foothold in the local funeral business. After 10 years, he purchased property on West StateStreet, and the funeral home moved to its current location, with the family residence next door. Walter and Richard, two of his children, joined the business after his retirement in December of 1938. On February 8, 1939, John William Embser suffered a heart attack while returning from vacation in Florida, and died at home two days later. By the time of his death, the Embser Funeral Home was thriving; it had sufficient property for expansion and was debt free. Walter and Richard Embser took on the task of running the funeral home, after many years of assisting their father. Following his death, the funeral home was renamed the J.W. Embser Sons Funeral Home, and it still holds that name. Both sons had been trained at the Syracuse Embalming School, and were well equipped to run the funeral home. In 1951 the family residence was remodeled into a second funeral parlor, allowing two funerals be held at once. In 1960, the Olmstead Funeral Home in Belmont was purchased, further expanding the Embser Funeral Home. Also in that year, Dave Gardner, Walter Embsers son-in-law, joined the firm.In 1976, Richard Embser died of a heart attack. Only months later his son John Embser, who had just completed studies at SUNY Canton, joined the firm. 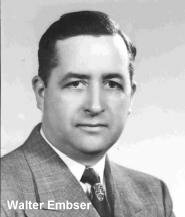 In 1980, Walter Embser passed away. Six years afterward, Walter Gardner, Walter Embsers grandson, became a member of the firm. In 1988, as the funeral home celebrated its 75th anniversary, it was again remodeled into its present state. 90 years after its founding, J.W. Embser Sons Funeral Home remains committed to providing compassionate service for all your funeral related needs. We appreciate the trust that that has been accorded to us by area families during these past 90 years, and hope to continue to serve the families of AlleganyCounty for many years to come.